Differentially hardened W2 blades after etching and prior to polishing. 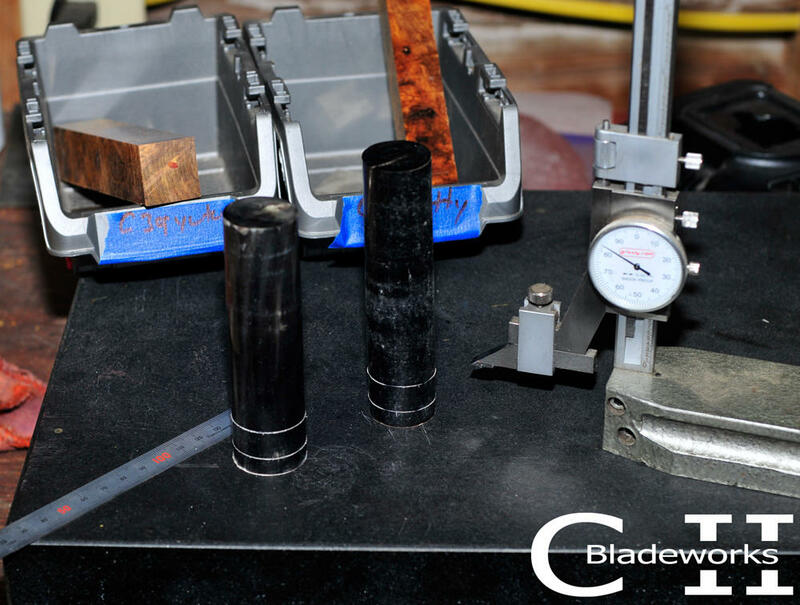 Marking buffalo horn for spacers and endcaps prior to cutting. These pieces will be part of the handles for the knives above. I like the hamon you did on the knives. Thanks guys. These are part of a matched set that I hope to have available in the next 10 days or so. Are you using sand paper or powder to polish? I generally do multiple etches and use sand paper upping the grit level with each etch. What grit do you typically end with? Took these blades to 1200....kind of depends on the blade...I have had some good results at 600 and have taken others to 2500. 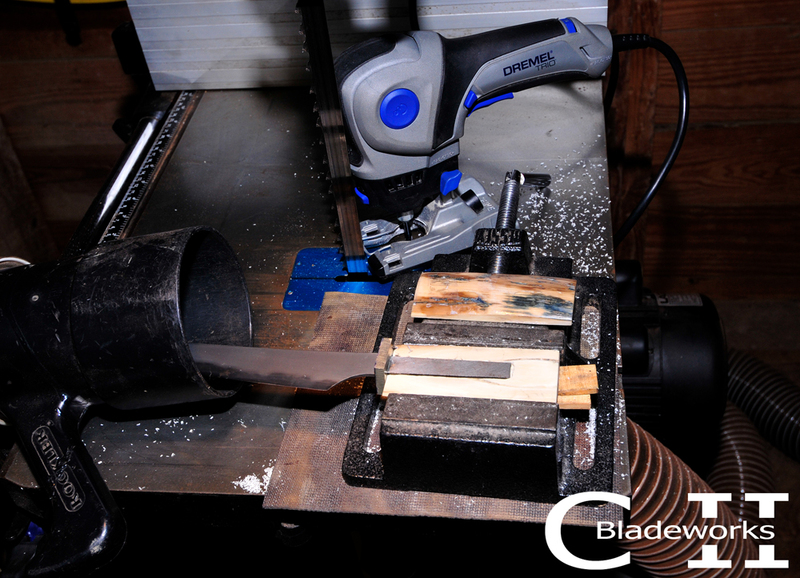 Sanding the etched blades is different than a non-etched blade. As I said, I took these to 1200, but it is not as shiny as a non-etched 1200 finish, but I am not really going for a super shiny finish, it is more about the grit level working with the hard and non-hardened steel and the hamon. Also, I left a few machining marks on these blades, nothing big, but just some handmade character. Thanks Carter. I’m gonna have to start playing around with that sometime. I’ve only etched after a high grit polish, so trying it out at a lower grit will be interesting & educational. I think you get a deeper etch and more defined hamon, with multiple etches and a progression of grits. 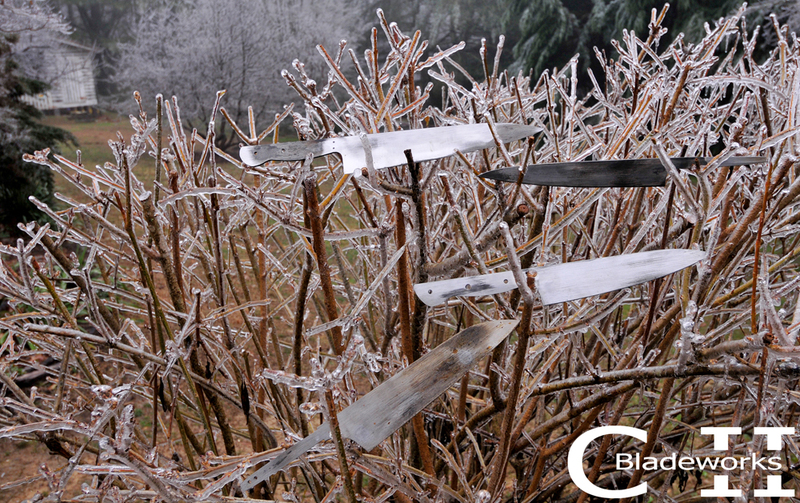 Here are the blades after multiple etches and a light 1200 grit polish. I like the sounds of that, I’m getting excited to see you do your thing Carter. I’m also thinking I need a wa version of one of your knives!! I’m also thinking I need a wa version of one of your knives!! I am working on a pair of Mammoth Ivory handled Yukawa knives. Here I am routing the inside of one of the handle scales to accept the tang of the knife. The discontinued Dremel Trio is a perfect little machine for this job with a carbide end mill bit. Please tell me that one of those is mine...that is pure awesomeness!! !